Coterminous with space and coeval with time is the kingdom of Mathematics; within this range her dominion is supreme; otherwise than according to her order nothing can exist; in contradiction to her laws nothing takes place. On her mysterious scroll is to be found written for those who can read it that which has been, that which is, and that which is to come. Even as a coin attains its full value when it is spent, so life attains its supreme value when one knows how to forfeit it with grace when the time comes. In The Crystal Arrow: Essays on Literature, Travel, Art, Love, and the History of Medicine (1964), 436. In ’Scientific Epistemology', The Philosophy of Physical Science (1938, 2012), 9. He rules all things, not as the world soul but as the lord of all. And because of his dominion he is called Lord God Pantokrator. For 'god' is a relative word and has reference to servants, and godhood is the lordship of God, not over his own body as is supposed by those for whom God is the world soul, but over servants. The supreme God is an eternal, infinite, and absolutely perfect being; but a being, however perfect, without dominion is not the Lord God. The Principia: Mathematical Principles of Natural Philosophy (1687), 3rd edition (1726), trans. I. Bernard Cohen and Anne Whitman (1999), General Scholium, 940-1. Hitherto, no rival hypothesis has been proposed as a substitute for the doctrine of transmutation; for 'independent creation,' as it is often termed, or the direct intervention of the Supreme Cause, must simply be considered as an avowal that we deem the question to lie beyond the domain of science. The Antiquity of Man (1863), 421. I have said that science is impossible without faith. … Inductive logic, the logic of Bacon, is rather something on which we can act than something which we can prove, and to act on it is a supreme assertion of faith … Science is a way of life which can only fluorish when men are free to have faith. If at this moment I am not a worn-out, debauched, useless carcass of a man, if it has been or will be my fate to advance the cause of science, if I feel that I have a shadow of a claim on the love of those about me, if in the supreme moment when I looked down into my boy’s grave my sorrow was full of submission and without bitterness, it is because these agencies have worked upon me, and not because I have ever cared whether my poor personality shall remain distinct forever from the All from whence it came and whither it goes. In Letter (23 Sep 1860) to Charles Kingsley, Life and Letters of Thomas Henry Huxley (1901), 237. If we evolved a race of Isaac Newtons, that would not be progress. For the price Newton had to pay for being a supreme intellect was that he was incapable of friendship, love, fatherhood, and many other desirable things. As a man he was a failure; as a monster he was superb. Interview with J.W.N. Sullivan, Contemporary Mind, London, 1934. As cited in James Roy Newman, The World of Mathematics (1956), Vol. 4, 2222. In science men have discovered an activity of the very highest value in which they are no longer, as in art, dependent for progress upon the appearance of continually greater genius, for in science the successors stand upon the shoulders of their predecessors; where one man of supreme genius has invented a method, a thousand lesser men can apply it. … In art nothing worth doing can be done without genius; in science even a very moderate capacity can contribute to a supreme achievement. Essay, 'The Place Of Science In A Liberal Education.' In Mysticism and Logic: and Other Essays (1919), 41. For strangeness and for fear. First line of a choral ode in Antigone, line 332, as translated in Harvard Classics. One of several variations given in Bernard Stiegler, Technics and Time, 3, (2010), 237. Mathematics is the life supreme. The life of the gods is mathematics. All divine messengers are mathematicians. Pure mathematics is religion. Its attainment requires a theophany. In Schriften (1901), Bd.. 2, 223. My aim is to argue that the universe can come into existence without intervention, and that there is no need to invoke the idea of a Supreme Being in one of its numerous manifestations. In The Creation (1981), Preface, vii. As quoted and cited in Karl W. Giberson and Donald A. Yerxa, Species of Origins: America's Search for a Creation Story (2002), 126 and footnote, 146. Personality is the supreme realization of the innate idiosyncrasy of a living being. It is an act of high courage flung in the face of life. Science, unguided by a higher abstract principle, freely hands over its secrets to a vastly developed and commercially inspired technology, and the latter, even less restrained by a supreme culture saving principle, with the means of science creates all the instruments of power demanded from it by the organization of Might. In the Shadow of Tomorrow, ch. 9 (1936). Simple molecules combine to make powerful chemicals. Simple cells combine to make powerful life-forms. 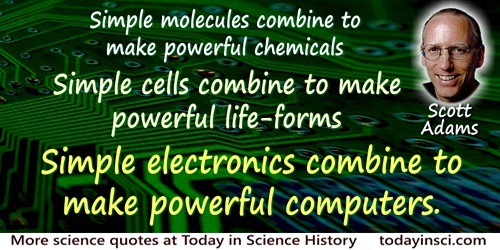 Simple electronics combine to make powerful computers. Logically, all things are created by a combination of simpler, less capable components. Therefore, a supreme being must be in our future, not our origin. What if “God” is the consciousness that will be created when enough of us are connected by the Internet?!! Thoughts by character Dogbert in Dilbert cartoon strip (11 Feb 1996). The cause of the six-sided shape of a snowflake is none other than that of the ordered shapes of plants and of numerical constants; and since in them nothing occurs without supreme reason—not, to be sure, such as discursive reasoning discovers, but such as existed from the first in the Creators's design and is preserved from that origin to this day in the wonderful nature of animal faculties, I do not believe that even in a snowflake this ordered pattern exists at random. Di Nive Sexangula, On the Six-Cornered Snowflake (1611), K18, 1. 6-12. Trans. and ed. Colin Hardie (1966), 33. The contest [between the wave and particle theories of light] is something like one between a shark and a tiger, each is supreme in its own element but helpless in that of the other. In Fison Memorial Lecture (7 May 1925) at Guy’s Hospital Medical School, London, published as The Structure of Light: The Fison Memorial Lecture 1925 (1925), 15. 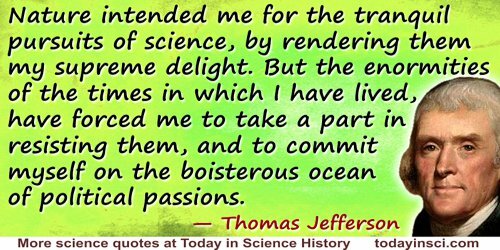 The great men of science are supreme artists. The great truths with which it [mathematics] deals, are clothed with austere grandeur, far above all purposes of immediate convenience or profit. It is in them that our limited understandings approach nearest to the conception of that absolute and infinite, towards which in most other things they aspire in vain. In the pure mathematics we contemplate absolute truths, which existed in the divine mind before the morning stars sang together, and which will continue to exist there, when the last of their radiant host shall have fallen from heaven. They existed not merely in metaphysical possibility, but in the actual contemplation of the supreme reason. The pen of inspiration, ranging all nature and life for imagery to set forth the Creator’s power and wisdom, finds them best symbolized in the skill of the surveyor. "He meted out heaven as with a span;" and an ancient sage, neither falsely nor irreverently, ventured to say, that “God is a geometer”. In Orations and Speeches (1870), Vol. 3, 614. The ideal of the supreme being is nothing but a regulative principle of reason which directs us to look upon all connection in the world as if it originated from an all-sufficient necessary cause. Critique of Pure Reason (1781), trans. Norman Kemp Smith (1929), 517. The law that entropy always increases—the Second Law of Thermodynamics—holds, I think, the supreme position among the laws of Nature. If someone points out to you that your pet theory of the universe is in disagreement with Maxwell’s equations—then so much the worse for Maxwell’s equations. If it is found to be contradicted by observation—well these experimentalists do bungle things sometimes. But if your theory is found to be against the second law of thermodynamics I can give you no hope; there is nothing for it but to collapse in deepest humiliation. Gifford Lectures (1927), The Nature of the Physical World (1928), 74. The law that entropy increases—the Second Law of Thermodynamics—holds, I think, the supreme position among the laws of Nature. The scientists speak with an authority which the ordinary citizen, the non-scientist, cannot challenge, and to which he is compelled to listen. Since they cannot hope for much help from the generals or the ministers, they must act for themselves, in a supreme endeavor to avert the mortal dangers which confront mankind. In 'Science and Disarmament,' Impact, 1965. The supreme reality of our time is…our common vulnerability on this planet. Address Before Irish Parliament, Dublin (28 Jun 1963). In Arthur Meier Schlesinger, A Thousand Days: John F. Kennedy in the White House (2002), 901. The terror of the thunderstorm led primitive man to the conception of a Supreme Being whose attribute was the thunderbolt. But when Franklin brought the lightning from the clouds and showed it to he a mere electric spark, when we learned to make the lightning harmless by the lightning-rod, and when finally we harnessed electricity to do our work, naturally our reverence for the thrower of the thunderbolt decayed. So the gods of experience vanished. Thus a statement may be pseudoscientific even if it is eminently ‘plausible’ and everybody believes in it, and it may he scientifically valuable even if it is unbelievable and nobody believes in it. A theory may even be of supreme scientific value even if no one understands it, let alone believes it. In Thomas Wallace Knox, Life and Work of Henry Ward Beecher: An Authentic, Impartial and Complete (1887), 274. To her [Florence Nightingale] chiefly I owed the awakening to the fact that sanitation is the supreme goal of medicine its foundation and its crown. In Pioneer Work in Opening the Medical Profession to Women (1895), 176. W. An. III. 241 a. From the original Italian: “Chi biasima la soma certezza della matematica, si pasce di confusione mai porrà silentio alle contraditioni delle soffistiche sci&emacr;tie, colle quali s’inpara vno eterno gridore.” English and Italian in Jean Paul Richter (trans. ), 'Philosophical Maxims: Of Mechanics', The Literary Works of Leonardo da Vinci (1883), Vol. 1, Part 2, 289, Aphorism 1157. [Note: Da Vinci writes &emacr;=en.] Also translated beginning, “Those who condemn…”. Also seen translated as “Whoever despises the high wisdom of mathematics nourishes himself on delusion and will never still the sophistic sciences whose only product is an eternal uproar,” in Nicholas J. Rose Mathematical Maxims and Minims (1988). [E.H.] Moore was presenting a paper on a highly technical topic to a large gathering of faculty and graduate students from all parts of the country. When half way through he discovered what seemed to be an error (though probably no one else in the room observed it). He stopped and re-examined the doubtful step for several minutes and then, convinced of the error, he abruptly dismissed the meeting—to the astonishment of most of the audience. It was an evidence of intellectual courage as well as honesty and doubtless won for him the supreme admiration of every person in the group—an admiration which was in no wise diminished, but rather increased, when at a later meeting he announced that after all he had been able to prove the step to be correct. In Obituary, 'Eliakim Hastings Moore', The American Mathematical Monthly (Apr 1933), 40, 191.